So what are the benefits of moving your operations out of the physical realm and into the digital? You might be wondering if there are any apparent benefits aside from being regarded as the “Eco-friendly” lawyer on the block who is saving the environment one Facebook post at a time. There’s plenty of measurable advantages to this decision—and yes, they’re economic and environmentally conscious. Reducing Expenses: Law offices of today require less storage space than they did in years past. Already, with younger generations of lawyers, a lot of law offices are beginning to shape-shift. As time wears on, the image of a classic brick & mortar office full of shelves and storage space is becoming dated in relation to the constantly evolving digital and legal landscape. Why pay more rent just to afford the luxury of having a whole wall devoted to archived folders when it can exist in the digital world at an exponentially lower monthly cost? These are the kinds of questions that are (or at least should) be bouncing around in the brains of lawyers who want to maximize their efficiency and grow their firm sustainably. Reducing even more expenses: Paper isn’t cheap. However, it accounts for 35 per cent of waste produced by mankind, according to the U.S. EPA. Apart from being one of the largest-polluting industries on earth, most of the paper consumed during the day-to-day activities of many businesses is actually for draft work and is only temporarily used to produce a final document. 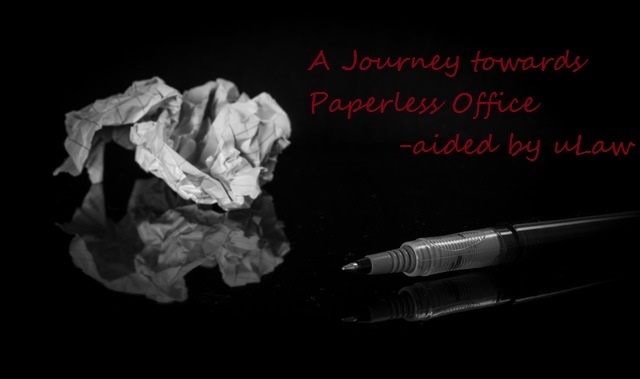 Cutting back on the usage of paper frees up monthly or annual expenditures, allowing you to re-route your business expenses towards more meaningful and important objectives. Enhancing productivity: What’s the longest amount of time you or an assistant have spent searching for one particular form or document? Perhaps your organizational skills are impeccable and retrieving most filings takes less than two minutes on average (including the time spent leafing through folders, opening cabinets, possibly scanning/printing if necessary). But what about the sum of time spent each year categorizing, tagging, numbering and archiving paperwork? Now, that’s a bit tougher to tabulate, but just think for a moment about the total time spent doing these tasks. A lot of time is spent in a legal office doing these activities at a speed which is, quite frankly, inferior to what a computer can do for a fraction of the price. The beauty of going digital is that a lot of burdensome activities traditionally conducted in a legal office with respect to organizing, retrieving, sending and even creating data is becoming automated by sophisticated software. Some of this software isn’t even regarded as sophisticated anymore: it’s merely the way computers work! Just look at the CTRL+ F function that exists on Microsoft computers. Why bother spending time leafing through a filing cabinet when a few keystrokes can get the job done much, much faster? A big reason why “going paperless” might seem preposterous for a lawyer is because signatures are such an inseparable component to a written legal system. Digital signatures and PDFs are making it possible to autofill and pre-fill documents so you don’t necessarily have to be going through the effort of printing and signing forms all the time. At uLaw Practice we’ve made it our duty to automate your chores inside a digital framework, essentially working as a personal assistant without the annual salary. We’ve been keeping up to date with trends in society in an effort to streamline transactions, which allows for both lawyer & client to conduct business at a superior speed. With smartphone usage becoming the norm among many people, it is extremely important to realize the benefits of sending invoices directly to clients, who are then able to pay you online by following the instructions on their screens. E-filing is also becoming commonplace within government as well, for example in Ontario it is now possible to file for Small Claims while on the web. At uLaw Practice, our goal is to make these digital day-to-day activities as seamless as possible. Using the power of automation and digital integration to unlock more hours in your work week, our software lets you spend your time effectively while slashing costs. It isn’t less secure – The notion of having paper is more secure than a computer file is not a correct perception. You’ve heard the horror stories: the office burned down, you need to be in court; so do you really have those forms on hand? Probably not. But having digital copies means the documents are always available, from just about anywhere at any time. With digital and everything it brings, whether it’s backup services, encryption or cloud storage, you can have a highly enhanced sense of protection and recovery while benefiting from the other characteristics of a paperless office. But you need to add security to your solution, read this article where we talk about such considerations. It’ll be a long time before your office is 100 per cent free of paper, perhaps never, but you might be saving a lot of money along the way while also doing your part to reduce waste. There are several Practice Management software solutions out there but only uLaw combines the power of Practice Management and Legal Accounting into a single package. The combination enables business analytic features and reports in the software. This provides improved business insight and at the end of the day SAVEs time and SAVEs money.